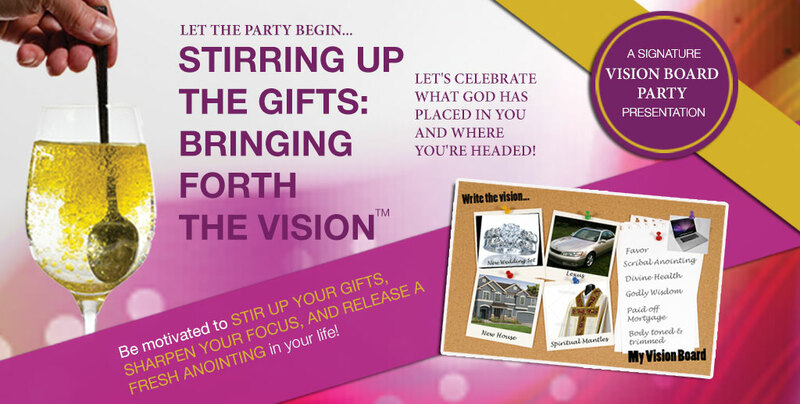 Stirring Up the Gifts, Bringing Forth the Vision is designed to inspire and empower as it invites the audience to see their God-given gifts in a whole new way! Presented as a part of one of my signature vision board workshop, this life-changing teaching will motivate your group to embracing their full potential, sharpen their visioning power, clarify their giftings, and develop them into multifaceted talents. During this presentation you will be inspired to stir up your gifts, sharpen your focus, and be directed on the necessary steps needed to fulfill your purpose and destiny.